For Martha Mkwanyana was featured in Botha’s (IN)SOMNIUM exhibition held at the Everard Read Gallery in Johannesburg in 2011. She is, significantly, the only female in a six-part portrait drawing series. 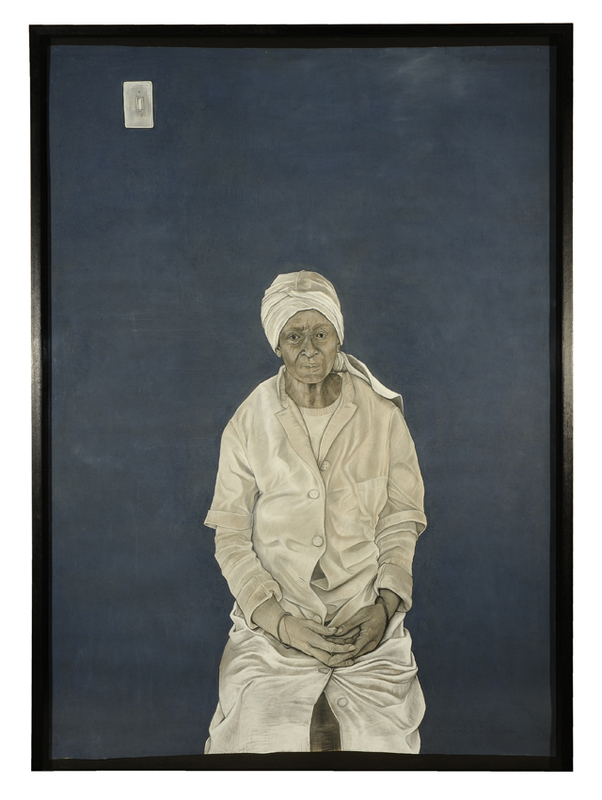 A central figure in an intensely dark blue background, her garment rendered sculpturally in its grey tones, marks her as a spectral image within her stark context, almost invisible. Her expression, however, holds us, reminding us, much like the light switch we can see in the artwork, of a functional but almost invisible ‘object’, which we will miss and notice only in its absence. This absence is a constant and significant presence manifested in most of our lives. Botha highlights this truism by treating both the light-switch and Martha’s garment in much the same way. Martha’s expression bears witness to the weight of her daily existence that she carries with her constantly. The context, and the statement by the artist, frames the consciousness with which the work speaks. Martha is ‘queen’ just as all the women in the Amazwi stories are. There are no victims in their narratives. We see the strength, courage, dignity, creativity, imagination and the respect that each woman conveys. It is this acquiescence to their circumstances that we acknowledge. It makes it possible for us to be who we are.